Ever wondered why professionals keep your coffee cup warm before they pour the coffee? Well, there is a good reason for it. Pouring coffee into a cold cup doesn’t only make your coffee cold, it can also affect the taste of it. A very good method to keep your coffee tasting hot and fresh is to preheat your cup every time you make a coffee. And guess what, you can give your machine a rinse at the same time too. Put your coffee cup underneath the spout of your machine, press the brew button with no capsule inside the machine, and the magic will happen. 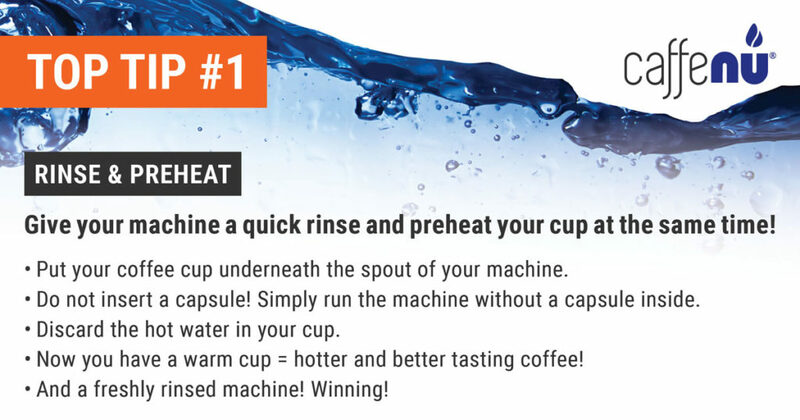 You can now swirl the hot water around in your cup and discard. You will have a warm cup, and a cleaner machine! As easy as that! Need a proper clean? Well, only using hot water simply won’t be enough to always clean that machine. Particularly those spaces you can’t see or reach. A detergent will be required, as hot water alone will not break down hardened oils, and debris. For those times, Caffenu’s cleaning capsule will do just the trick! The cleaning capsule by Caffenu is used just like a coffee capsule. You insert it, close the lever, press the brew button, and the capsule goes to work. The capsule releases a foaming substance that will clean the brewing chamber and completely remove bacteria and build-up left behind from past usage. The best part is it will clean the entire brewing chamber in just two minutes. Use at least once a month to maintain your machine properly. By removing old coffee oils, and tannins, Caffenu is helping you to get the perfect tasting cup of coffee every time. Remember to rinse the brewing chamber after cleaning. Find Caffenu’s cleaning capsules here for your country. This entry was posted in quotes and tagged Caffenu Clean Brewing Chamber.